Nano Reef is a smaller scale saltwater aquarium setup that consists of different kinds of fish that measures less than 20 gallon size. It is mostly used in smaller household to save space and avoiding the hassle of time-consuming fish tank maintenance usually associated with large aquarium size and that is where the concept of nano reef comes in. Just like any saltwater fish tank, the reef setup can also contain live rock, corals and live sands as the main attraction. Nano Reef is definitely an exciting addition to those who intend to keep new saltwater pet fish. The usual notion is that a nano reef would usually demand high-end aquarium equipment to keep it running but this is not true. 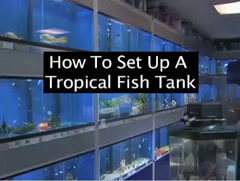 Basically the most important equipment you will need is the aquarium filter and another is the tank lighting. Another option in order to ensure that you require least number of water changes is by getting a protein skimmer so that foreign materials can be easily removed. There are several types of fish you can use. Based on the number of invertebrates plus coral that can fit into the tank, your number of fish should be kept to less than 5. For pet fish that requires less attention, your choice should be limited to either having blennies or damselfish which are hardy species for your new tank. In order for the corals to thrive, make sure that metal halide is used instead of the incandescent or fluorescent lighting. Some hobbyist also go to the extent of adding live crabs which will get rid of algae in the tank and keeping the whole environment clean. Salinity is an important measurement for a new nano reef setup because anything out of normal range will cause upset to the whole system. Therefore marine pet fish hobbyist will always prepare another backup tank to contain saltwater and immediately change if sense that there is something wrong. Apart of that, coral sand is also another recommended addition because it contains live bacteria that can help jump start a healthy and stable fish tank. Almost every individual are bound to like the Freshwater Puffer Fish due to it unique characteristic that often looks cute. They are commonly sold in major pet stores and with some larger size puffer fish offered for sale together with some other fish so that you can put them together in a community tank. If you are a serious hobbyist, you should consider getting this unique species to become your new pet fish friend. Unlike its closely related cousin of the saltwater origin, most freshwater puffer will only require normal household treated tap water without addition of marine salt. They are also part of the group of fish originate from the tropical region and they prefer temperatures around 25 to 28 degree Celsius. Puffer fish is often characterized by it hard, leathery skin and its whole body is covered with tiny spines. When under stress or threatened, your pet will puffer up and turn into larger size, so do not get alarmed. Freshwater puffer fish require delicate care and attention. The water in the fish tank which you provide to them should be regularly attend to, in order to make sure that pH, alkalinity, temperature is always at constant level. Apart from that, ammonia and nitrite are also two critical parameters whereby you should keep both of these are minimum level. Because puffer’s skin is mildly toxic, the carbon which you use for the aquarium filtration should be regularly changed or else the toxic accumulation can be hazardous to other community fish species. There are several types of freshwater puffer, which you can consider buying and kept as new pets. The green puffer is one of the commonly found species but this particular type only thrive in brackish water which means they require some addition of salt. Green spotted puffer can also be mixed into community tank but however, care must be provided to ensure other fish has sufficient hiding place with best setup using large 100 gallon tank so that the other fish do not get harassed. Other pet addition which you can also consider is the dwarf or yellow puffer, which is a totally freshwater type. This species which is also known as Carinotetraodon travancoricus only grows up to 2.5cm so they are definitely well-suited for small tank size.